Last week JP Morgan Investor Research reported that wearable computer devices are poised to grow from less than $4B to $40-50B market in a few years. We have seen a few Star Trek like devices in the public lately and most recently the pre-release test ‘explorers’ by Google which is called Glass. There are other devices planned for the marketplace in the coming months, including a device from Apple, tentatively called Apple iWatch. Wearable devices that primarily use hand gestures, finger taps or voice command will make these devices true hands-free computing communicators. These devices have so far demonstrated limited consumer utility earning them high tech gadget status. But, will they become mainstream in the industrial, corporate or manufacturing environment? How can they make a positive impact? Can they really make the workplace safe, effective and efficient? Let’s examine a few scenarios for this hands-free tool. There are some areas in some sectors where human hands can be used elsewhere while you have access to information. Take for example, aircraft engine manufacturing or MRO facilities, where you could have the instructions, or schematics as you are dealing with high value assemblies. This would provide a safe environment but also quality output and cost savings. Another instance of good use is where your hands cannot access a laptop or tablet, as in a environmental disaster area, clean suit area or other places where you would like the information without stopping work and getting to a workstation. You are performing an audit in a nuclear plant, and here you can go through the checklist whilst wearing a safety suit and helmet. So how would such an interface in an industrial setting go….. Picture yourself in a semiconductor facility, in a bunny suit, addressing an issue with a lithography process…. 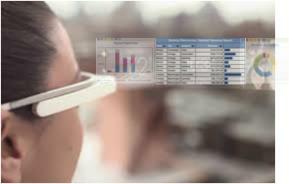 So there are uses for wearable computing devices that offer hands-free, projected visuals without impeding other functions, hence, saving valuable time, providing real-time access to information with greater form factor to meet the occupational requirements. It is breakthrough right now, but only time will tell if these devices will become the disruptive mainstream with acceptable utility in industrial or ruggedized setting.